"My best can be better." "I adore dollhouses and dolls and still have a big collection." "My dad, J.R.R. 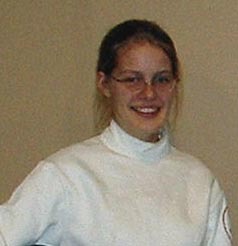 Tolkien, Rebecca Blakeslee, and one of my fencing coaches (I can't decide!)" "Letting Karen Vaughn get 10 free touches at the 2003 Intra-Squad Tournament--NEVER AGAIN!"